I want to talk about one of the attributes of God that the bread and the wine should remind us of. Many times we talk about how they represent His love, His Mercy, or His grace, and they certainly do represent that. But those only have meaning for us if they also represent something else — the wrath of God. In looking for a good definition of the wrath of God, I really liked one by Arthur W. Pink. A just and holy God can only have one reaction to evil, and that is wrath. This is not God losing His temper and lashing out. This is a very calculated and perfect reaction to sin. Joel speaks of God’s wrath and ultimate punishment of all the nations that oppressed God’s people. They will be judged and ultimately destroyed. The wrath of God on the unbelieving nations is described as God’s trampling of the grapes in the winepress (3:13). The angel swung his sickle on the earth, gathered its grapes and threw them into the great winepress of God’s wrath. They were trampled in the winepress outside the city, and blood flowed out of the press, rising as high as the horses’ bridles for a distance of 1,600 stadia (180 miles) (Revelation 14: 19-20). In Revelation 19:11-15, He returns on a white horse to judge and wage war. His eyes are a flame of fire. 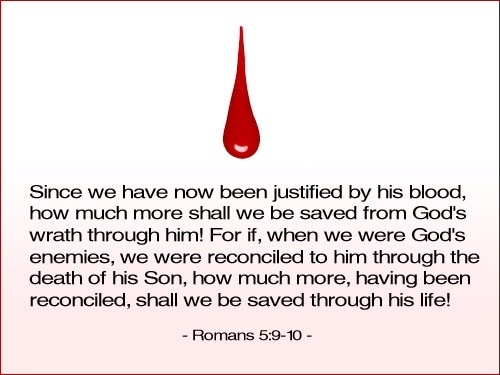 He is clothed with a robe dipped in blood. From His mouth comes a sharp sword to strike down the nations. “He treads the wine press of the fierce wrath of God, the Almighty” (19:15). This is another way in which the bread and the wine are such perfect symbols. In order for bread to be made, the grain must first be crushed into flour. And in order to make wine or juice, the grapes must be crushed in a press. This juice we hold in our hands was the product of crushing, in the same way that the blood of Jesus was shed as He bore the wine press of the wrath of God for our sins. Yet the Lord was pleased to crush Him severely., When You make Him a restitution offering, He will see His seed, He will prolong His days, and by His hand, the Lord’s pleasure will be accomplished. for all have sinned and fall short of the glory of God, being justified freely by His grace through the redemption that is in Christ Jesus, whom God set forth as a propitiation by His blood, through faith, to demonstrate His righteousness, because in His forbearance God had passed over the sins that were previously committed, to demonstrate at the present time His righteousness, that He might be just and the justifier of the one who has faith in Jesus. Jesus was crushed to satisfy the wrath and the justice of a holy God. I would encourage you next time as you eat the bread and drink the juice with the wrath of God in mind, to meditate on Jesus, the one who endured the wine press of the wrath of God for your sin. The perfect One who The Lord crushed for our justification.